Found this stunning video on the Over The Moon site from a wedding we were a part of in 2011. It was a beautiful wedding at the LA River full of color on culture. Below we have included some of our Instagram videos from the night as well. I love to see the polished videoographer and photogrophers picutes then cut to our posts of the party getting wild. When you get to play tunes three years in a row for an awesome client and live to share a video. 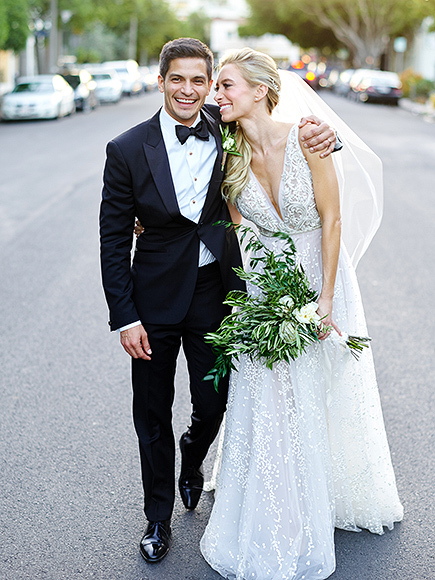 The Flash's Nicholas Gonzalez Marries Kelsey Crane! Congratulations to Kelsey and Nick Gonzalez!! HMD played music selections for their wedding this weekend. The Flash star married actress Kelsey Crane on Saturday in front of over 200 guests – includingHow to Get Away with Murder's Charlie Weber – at Los Angeles' Fig & Olive restaurant, PEOPLE can confirm. "It has that Italian flair that's a big part of our love," Gonzalez, 40, tells PEOPLE exclusively of their wedding venue (the couple got engaged in Capri, Italy in 2015). "It was the perfect spot." For the occasion – planned bySterling Social – Crane, 33, wore an ethereal gown by Liz Martinez and Gonzalez wore a classic black tuxedo by John Varvatos. Guests arrived to the venue's outdoor Provence Courtyard to tray-passed Limoncello shots. During the ceremony, Crane carried a bouquet of wild greenery and soft white blooms, and walked down an aisle layered with woven rugs and lined with potted herbs. The couple exchanged vows underneath a wood chandelier adorned with fresh lemons and soft greens. The reception took place inside the restaurant, which had been transformed into an Italian villa with various linen furnishings, iron and marble accents, and soft collections of florals with glowing candlelight. Gonzalez and Crane had their first dance to Angus & Julia Stone's version of "You're the One that I Want." Following the dance, the couple opted to forgo a sit-down dinner to achieve a more lounge-style feel for the evening. "We knew we didn't want a big sit-down," says Gonzalez. "We wanted it to be a great party, where people would mix and get to know each other. We just have such fun friends and family."